How to smoke a Premium cigar For A beginner ? If you are new to cigar, you may have heard stories about it. Well, I don’t know the version you have listened to, but let me tell you that cigar is a living thing for living people. The cigar is for people who love life, those who are in control of what they do: the business executives, successful professionals, and celebrities and the icons of their industries. The living adores cigar to relieve stress, enable to think and solve problems. I congratulate you if you fit in the description above and this discussion is for you. 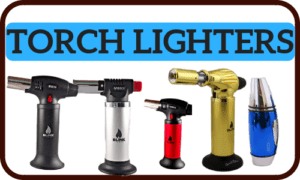 The scope and content of this article are developed to address starters in cigar smoking. A cigar is a roll of authentic tobacco leaves; it contains whole tobacco leaves rolled consistently to give the right fold and tightness to allow smoke course through it for smooth and cool cigar taste. There are different types of cigars, but the premium quality cigar gives you the best in flavor and taste. If a cigar is taken apart, you will find the following makeup: Cap, Filler, Binder, Wrapper, Foot and the Band. The Cap. The Cap of the cigar is what goes to the mouth for smoking. A cigar comes with a covered cap; the cap has a thin line or seam located around the head of the cap, this is where you need to cut before smoking. The Filler. This occupies the center of a cigar and delivers the flavor you need. The Binder. It encases the filler tobaccos and serves as conduits for even burning and combustibility of the cigar to maintain its structure and density as it burns. There are single and pair binders, premium cigars have two binder leaves and are great! .The wrapper. It is the outside cover of the cigar. This is what you notice, apart from the binder, especially if you are looking to pick a cigar by its color. The wrapper dictates the choice of what cigar to choose because it determines the flavor and it’s the decider in drinks peering. The foot. It is the end of the cigar where you introduce the fire to light it for smoking. The band. Of course, it is the second visible part, perhaps the most noticeable, of a cigar which contains the brand information. It is with the band you can identify the premium cigar you love. Are there benefits for smoking cigar? I am not saying cigar has no downside when it comes to health, but everything in life does. Yes, cigars have health benefits and one of them being a stress reliever! The health benefits notwithstanding, it is recommended to smoke cigar responsibly! Selecting the ideal drink with your cigar gives you a great taste and smoothness. The cigar is a social item, and you need the right mind and environment to enjoy smoking. This is the reason cigar pros visit cigar hangout to mix with people of like minds. The general rule about the drink that matches your cigar is to choose the color of the wrapper and the whiskey! Doing so gives you a great taste and smooth feeling. Hold the cigar by the binder; carefully look at the cap for the ring like seam around the cap. Cut the cigar. 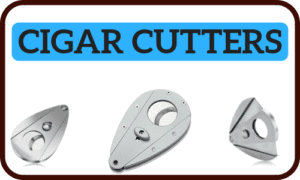 With the cutter, cut off slightly above the lower seam, cut about 1/8th of an inch; avoid cutting below it so the wrapper won’t come apart. Step #2: Toast the foot. Hold the cigar by the band, at angle 45-degree and apply the blue flame in a rotating manner to heat the cigar foot; the reason for this is to warm or wake the cigar to its duty. Step #3: Light the cigar. When lighting the cigar, avoid letting the flame touch the foot, only use the heat to burn it. This time put the cigar in your mouth at the cap you cut earlier and gently puff a few times as you apply the heat without inhaling, do this until you could feel the smoke in your mouth. Step #4: Make it burn evenly. See if the foot burns evenly, if not, re-toast the foot with the lighter or blow the foot lightly. The entire foot of the cigar should glow evenly. Don’t inhale the smoke. Never inhale cigar smoke because it can make you feel sick; what you need is to taste the flavor and release the smoke. Cigar pros don’t let it go past a third of their mouth; it never gets to the lung because that will be trouble. Smoke on. It’s time to relax with your glass of scotch as you smoke your cigar. Puff your cigar every 30-60 seconds or as you are comfortable with. Don’t ash the cigar. As you smoke, allow the ash to grow as long as it can hold and gently tap it on the edge of the ash-tray to fall off naturally. When you are not smoking the cigar, allow it to burn it will die naturally; do not smash it in the ashtray to put off the fire. 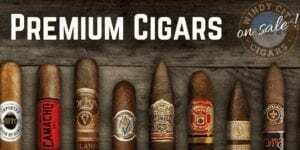 There are tons of cigars out there; so many choices to pick from, this is why it’s best to work with experts in the field who can guide you in making the right choice. At Windy City Cigars, you are in good hands because they deal in premium cigars, name the best in town and windy city cigars people will be happy to help you. If you need help with a cigar as a starter, feel at home at Windy City Cigars! 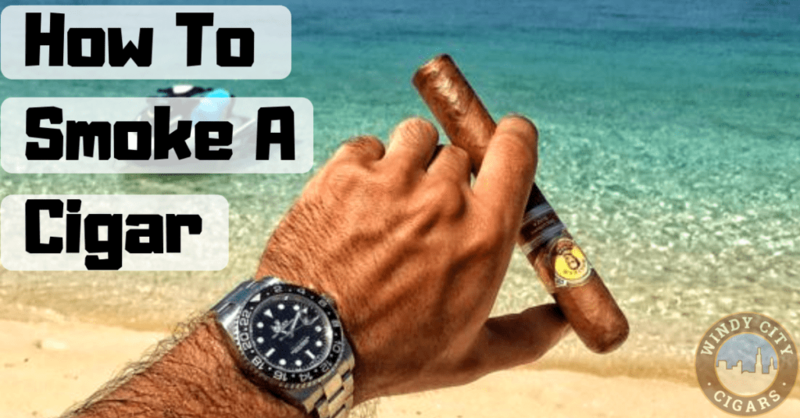 This entry was posted in RYO LifeStyle Blog and tagged how to smoke, how to smoke a cigar.